NOIDA: A fire broke out in Metro Hospital and Heart Institute in Noida on Thursday, trapping several people inside the multi-storeyed building. There were no immediate reports of any casualties, officials said. Four fire tenders were rushed to the spot and the situation is “now under control”, Mr. Krishna told PTI. Thick smoke was seen billowing out of the building in Sector 12. People stood on ledges and on balconies as rescuers tried to reach them by smashing glass window panes. Around 10 fire tenders were rushed to spot and the situation was brought under control, fire department officials said. The second floor of the hospital, where the fire broke out, has already been sealed, he said. The cause of the fire was a short circuit that occurred in a water heater which was placed inside the recovery area of the hospital where patients are kept for sometime after being discharged from Intensive Care Unit (ICU), the official added. 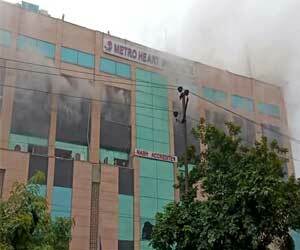 The Metro Hospitals and Heart Institute in Noida Sector-12, where a fire broke out on Thursday, was functioning without a fire licence that expired over five months ago, officials said. “The hospital authorities had got a license from the fire department in March 2017, but they did not get it renewed from over five months,” Gautam Budh Nagar Chief Fire Officer (CFO) Arun Kumar Singh told PTI. The hospital authorities did not respond to repeated calls and text messages. The CFO said that a major tragedy was averted following a quick response from the firefighters. Another official of the fire department said the hospital’s licence was up for renewal from past four to five months. “We did not accept their request as we gave them several suggestions as per laid down rules and asked them to implement the same,” he said. The official said that the Noida fire department will take necessary action against the hospital management for their “failure” in getting their licence renewed from the authorities. “We will send a report over the lapses on the part of the hospital to the director general for necessary action in the case,” he said. In December 2017, a similar incident took place at the Metro Hospital and Cancer Institute in east Delhi”s Preet Vihar area. The hospital had two buildings and one of them did not have a fire No Objection Certificate (NOC).